The team of instructors assisting Shihan Denis Cordeiro is very united. These Senpai are all Shihan Denis’ students and they continue to train under him. They joined Montreal Kanreikai Karate school at about the same time and have risen through the ranks together. They know and respect each other well. These teachers are complementary through their respective experiences, personalities and abilities. They ensure both continuity and renewal in Montreal Kanreikai Karate teachings. Sensei Kateri started training under Shihan Denis Cordeiro in late 2002. Since then, through her strong self-discipline in training and her excellent technique, she has been an inspiration to every student at our school. 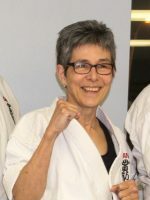 It does not matter how big the challenge is, Senpai Kateri will find a way to rise to it and reach beyond her limits, which is exactly what Kanreikai Karate is all about. Her love of karate, strong determination and hard work led her to a successful 1st dan Black Belt Promotion test in August 2007. She then got her 2nd dan Black Belt in August 2011 and her 3rd dan Black Belt in August 2017. Senpai Kateri has been teaching at our dojo since 2007. Her patience, natural empathy and attention to detail make her an excellent teacher appreciated by young children as well as adults. Senpai Samuel started practicing karate with Shihan Denis Cordeiro at the age of 9. Since then, Samuel has been training with rigour and intensity. Very talented, he has participated in many tournaments, competing in both kata and fighting events. Senpai Samuel is a very good technician in kata. He is also a strong and tough fighter who never backs down from a challenge. He is a role model for all our young students who realize – as they see him fight – that an efficient fighter relies on impeccable basic techniques. Samuel got his Junior Black Belt in August 2006 and his 1st dan Black Belt in August 2009, becoming the first in the World Kanreikai Karate Organization to have been promoted from Junior to Senior Black Belt. He reached the rank of 2nd dan in March 2014. Senpai Samuel started teaching at our dojo on a regular basis in 2007. He has since acquired lots of experience. He is very appreciated by all his students for his dynamic, rigorous and motivating classes. Senpai Audrey-Rose started training under Shihan Denis Cordeiro in 2006. She quickly became part of the Kanreikai family and trained intensively to join the competition team. 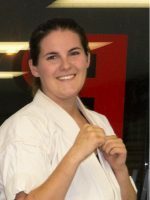 She competed in kata and fighting events in numerous karate tournaments over the years. Her phisical abilities and strenght led her to international knockdown fighting events. Senpai has obtained her 1st dan Black Belt in 2011 and her 2st dan Black Belt in 2017 at promotion tests supervised by Hanshi Manny Matias. Both times, she took up the challenge, thanks to her talent and determination. 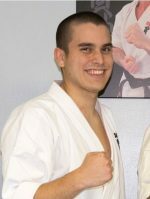 Senpai Anthony started training under Shihan Denis Cordeiro at a very young age. He reached the Yellow Belt level as he was training in competitive swimming and high school football. It is in 2012 that he resumed his karate training with intensity ans assiduity. Senpai Anthony has since worked his way up with much talent and dedication. He has been Ushi Deshi (student in residence) with sensei Calvin Ortiz in Ravena, NY. 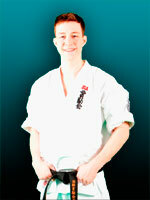 He has had success competing in kata and fighting events, displaying control, power and agility. Senpai Anthony has successfully tested for his 1st dan Black Belt under the watch of Hanshi Manny Matias, in August 2018. Again, he showed lots of talent, determination and resilience. Being particularly good at teaching, Anthony has been an instructor since 2016. He rapidly earned the respect and the affection of his students who especially appreciate his energy and enthusiasm.